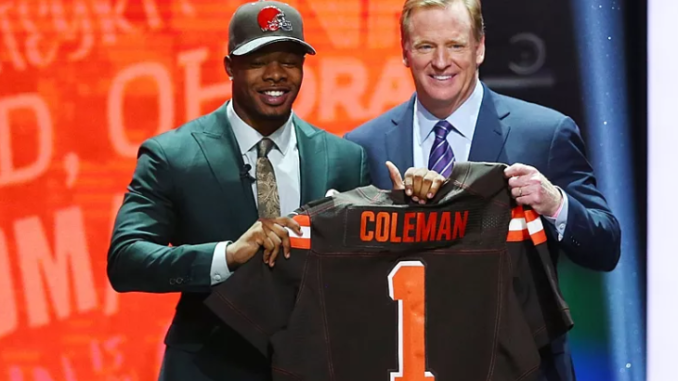 Looking back at the 2016 NFL Draft, there’s a handful of teams that no doubt would like a do-over with their first round pick. This article looks at 7 teams that, in hindsight, should have taken a different player while sticking with the same position that they drafted. The top 5 of this draft was pretty strong with Jared Goff, Carson Wentz, Joey Bosa, Ezekiel Elliot, and Jalen Ramsey all becoming major contributors to playoff teams over the past couple of years. Howard was the 6th CB drafted and is now one of the best in the league, as he graded out as one of Pro Football Focus’s top CBs in 2018. He has played all but one game over the last three years and has recorded 11 total INTs. Apple has just 3 INTs and was traded by the Giants halfway through last season. Rankins has 14 sacks in his career with the Saints. In 2018, Chris Jones had 15.5 sacks and earned second team All-Pro. He has also played in all 48 games through three seasons. In 2017, Byard led the NFL in interceptions (8) and was named an NFL All-Pro. He only had 4 interceptions in 2018. which is one more than Joseph has registered in 40 career games. In 2018, Coleman was cut more times (3) than he scored touchdowns in 2017 (2). Meanwhile, Michael Thomas, the 47th pick, is one of the 3 best WRs in football. Lee is reportedly on the trade block, which should tell you all you need to know about how the Jets view him. Smith started slow, as a result of a devastating injury suffered in his final collegiate game, but proved to be a dominant player in 2018. Imagine Tyreek Hil lined up next to DeAndre Hopkins? Fuller has been good, when he is on the field. He has played just 31 out of a possible 48 games, but has 13 touchdown catches in those 31 games. Tyreek Hil has missed one game and is simply on another level from Hill. He eclipsed 1100 yards as a sophmore and last season went over 1400 yards. He has 25 total touchdowns, including 12 in 2018. Even if you are not a huge fan of Prescott, Lynch is already out of the league and has been awful. Lynch went 1-3 in his only 4 starts over the 2016-2017 seasons and has 4 TD and 4 INTs. Meanwhile, Prescott, who was the 8th QB off the board, has started every game the last three years going 32-16, winning two NFC East titles, while completing 66% of his passes, 67 pass TDs and just 25 INTs. Over the last three years, Trevor Siemian, Brock Osweiler, Paxton Lynch and Case Keenum have started games for the Broncos, who have gone 20-28 since winning the Super Bowl in 2015.